. : Farm Forest Line - Weed control :. Weed competition is the most important factor affecting trees survival and early growth. In a farm forest context, a weed is anything that competes with a young tree for moisture or light. Removing competitionusing chemicals, mulch or cultivation encourages rapid, early growth of trees. The appropriate amount and timing of weed control depends on the trees growth rate and the weed type. 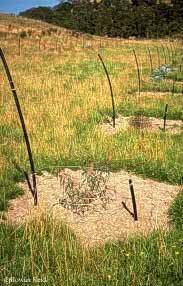 Newly planted seedlings that grow free of weed competition for a full growing season will usually not require any further protection from shallow rooted weeds. Weed control in the second and subsequent years is usually only justified where tree growth is very slow or where there is extremely vigorous competition from deep-rooted grassessuch as Phalarisor woody weeds.  risk of environmental hazards. The most common methods of weed control involve applying a combination of pre- and post-emergent herbicides prior to planting. For some tree speciesfor example. Pinus radiatathere are chemicals that do not damage the planted trees which can be applied over the top of young seedlings to control weeds. Some farmers have access to free, suitable mulching material and this is an option if they do not want to use chemicals. Plastic, carpet or weed matting can provide effective weed control for more than a year. Organic mulches like hay or wood chips may be less effective unless regularly added. In any event mulching remains a very labor-intensive option.